H andsome Bentley is a Canine PartnerCanine Partner dog – he assists his Mum with lots of household tasks. Things like getting the washing out of the machine, clearing up the laundry, taking socks off, opening doors and other remarkable things. We delivered a massage training session last year to 12 of the Canine Partner instructors and their dogs. Bentley is 2 in May this year – the same day as my birthday (except I’m not 2) so I had fallen in love with him already. His aftercare instructor at Canine Partners felt he was showing signs of muscular discomfort. He was very body sensitive, and avoidant of touch in certain areas. She asked if I could go and visit. When I spoke to his Mum beforehand, she explained a bit more. She said he is hit and miss with pressing the lift button and road crossing buttons. Both these movements involve him stretching or jumping up and hitting the button with either his paw or nose. But is fine with the lower light buttons. Clues? He also mainly walks to the left of his Mum when they are out and spends a lot of that working time looking forward or up at her. More clues? He has been a Partner since the end of last year and has already endeared himself to his Mum. She said that when he arrived, she had a strict not-on-the-bed policy. But now when she wakes up, she invariably finds him snuggling next to her and before they get up, he demands his morning cuddle. Despite his amazing abilities (at one stage I dropped my phone case on the floor – he immediately went and picked it up for me and Mum says he often clears up the discarded clothes left behind in shop changing rooms) he is still young and playful. It was evident something was causing him to react when his back was touched. He was fine with his neck, chest and shoulders but uncomfortable mid back. Just as I was feeling it, his Mum said that she had felt a hot spot right where my hands went which is exactly what I was finding. Clever Mum. Put this palpation together with the clues and it would suggest he may have over-pulled or over-stretched at some stage which has led to a stiff back. Imagine your shoulder is sore and you’re being asked to reach up to press a button. You’re going to think a bit about it – hit and miss. As well as massage for him, which Mum can do on the bed or sofa, his Mum and I had to do some Out of the Box thinking on how to help him stretch his back. We couldn’t do any floor work. Luckily Bentley loves treats – he is a Labrador after all. 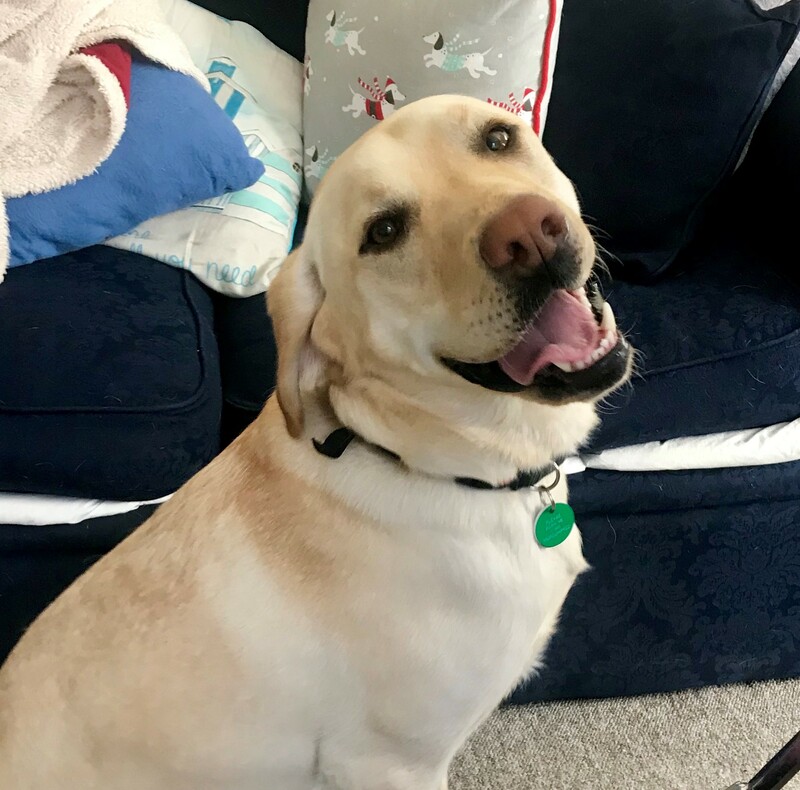 To get him to stand and stretch, we raised the treat while he was standing up to her lap in the chair, and Bentley’s nose followed – which pulled his whole body upwards creating space in his back. We couldn’t do Figure of Eight walking to get him turning but we could play a newly invented exercise game – the Round the Wheelchair game. 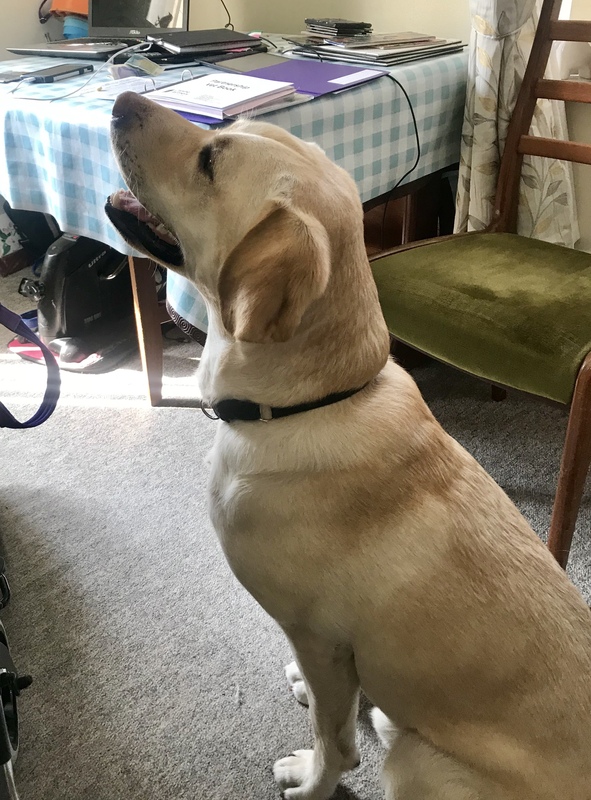 Mum held the treat out and moved it round one side of the chair then swapped hands and moved it the other side – Bentley followed like his nose was glued to the treat. Worked a treat, you could see his back becoming more mobile. We’re going to add him to our maintenance programme to keep that handsome young body supple and healthy. This entry was posted in acheypaw, achy paws, AchyPaw, achypaw myotherapy, Brighton Dog Massage, canine myotherapy, dog myotherapy, achypaw myotherapy, myotherapy, achy paws, confidence boost, Dog, Dog massage, dog myotherapy, empowerment, massage benefits, multimodal therapy for dogs, myofascial release, south coast myotherapy, therapeutic massage and tagged acheypaw, achy paws, achypaw, achypaw myotherapy, achypaws, Canine massage, canine myotherapy, Dog massage, dog muscle therapy, injury prevention, myotherapy, not just arthritis, Saltdean, south coast dog massage, south coast myotherapy, therapeutic, therapeutic massage, www.achypaws.com. Bookmark the permalink.